Can Dak Prescott lead the Cowboys to victory in his first career playoff start against the Packers? 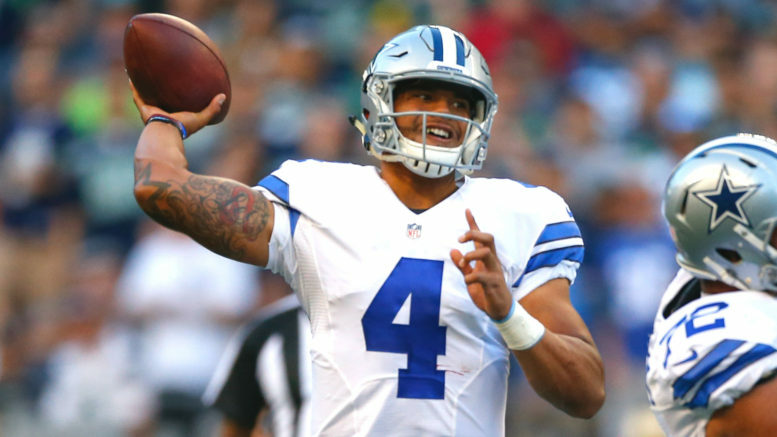 Perhaps the bigger question is, will he replaced by Tony Romo on Sunday if he struggles? Maybe the problem isn’t that Matt Ryan can’t win playoff games. Maybe it’s just that he hasn’t played the Seattle Seahawks enough. Ryan’s lone playoff victory in five tries came against Seattle in the 2012 divisional round, after the Falcons blew a 20-point lead but won on a long field goal by Matt Bryant in the closing seconds. Atlanta’s potent offense scored 540 points this year, eighth-best all-time, and felt it had a win taken away from it in Week 6 on a non-call against Julio Jones. Here’s thinking that in what could be the final game ever at the Georgia Dome, the Falcons “rise up” and find a way to break the Seahawks’ hearts again. Seattle wasn’t overly impressive last week against Detroit, even though it won by 20 points, and the Falcons have been flying under the radar all year and would love to enter the national spotlight. Pick: Falcons. This is a joke, and the league should be embarrassed. Obviously, they can’t stop the Patriots from winning and getting a bye every year (even though they tried by suspending Tom Brady for four games), but they could examine more closely the possibility of eliminating divisions and implementing a re-seeding system so that you don’t have unworthy teams like the Texans waltzing into Foxborough downright overmatched. Sure, Houston has the top-ranked defense in terms of yards — and New England owns the league’s best scoring defense — but it won a terrible division by a hair and earned a lucky home win against the 12-4 Raiders because they were sans Derek Carr. Bill Belichick and Tom Brady almost never lose after a playoff bye, let alone at all in January. Tom Terrific is 22-9 in his postseason career, including 1-0 against Houston. At first I was quite tempted to pick the Texans for the gentlemanly cover, but then I remembered that they lost by 27 points to the Patriots in Week 3 when Jacoby Brissett was making his first career start. There is no way in you-know-where the Texans win this game, and I’d be surprised if they kept it competitive after halftime. It might not be 45-10 like it was when the Patriots hosted the 8-8, Tim Tebow-led Broncos in 2011, but New England should coast into the AFC title game (again). Pick: Patriots. In a weekend where all four games are rematches from earlier this year, this marks the only one in which the road team won the first meeting. Dallas won at Lambeau, 30-16, back in October, but the Packers are white-hot right now in winning seven straight, and all the pressure is on the Cowboys with a rookie signal-caller and the prospect of another Super Bowl-less season in Big D. The potential absence of Jordy Nelson definitely hurts, but the Packers look like they’re on a mission after Aaron Rodgers declared they would run the table. We might see Tony Romo in this one, but that also might mean the Cowboys have a big hole to dig their way out of. Pick: Packers. Things never seem to go the Chiefs’ way in January, and before this game even gets played Mother Nature has sacked Kansas City for a loss. A pending ice storm pushed this game to Sunday night, perhaps giving Ben Roethlisberger’s gimpy foot a little extra time to heal. It also shortens the turnaround time for the winning team that has to go to Foxborough to face the Patriots in the AFC championship game. The Steelers, like the Packers, are surging right now, with a red-hot quarterback and two incredibly dynamic playmakers at his disposal. The defense is also on fire, and it’s hard to imagine Alex Smith lighting them up whatsoever. No, it won’t be 43-14 and Big Ben won’t throw 5 TD passes as was the case in Pittsburgh’s Week 4 blowout win, but the Chiefs won’t get their first Arrowhead playoff win since edging the Steelers in overtime in the 1993 wild card round. Roger Goodell and his cohorts will get their dream AFC title matchup 12 years in the making in Steelers-Patriots, and those who aren’t fans of Pittsburgh and New England will respond with a collective yawn. Pick: Steelers. Be the first to comment on "3 Teams Coming off Byes, Pats Get Another"